After Christmas, I took my kids to San Francisco to visit my brother, sister-in-law, and cute nephew. While we were there, we went to the Exploratorium, which is a hands-on science museum. Seriously, one of the coolest places I’ve been. Even the water fountain has a gizmo attached to it so that, the harder you push on the bar to get the water, the louder it plays music. I’m not kidding. My favorite part of the whole museum, though, was called “The Tinkering Room.” The exhibit showed how you can recycle and make new things from old things. Right up my alley. My brother knew as soon as he saw it that I was gonna be in there a while. This is the arched entry to the Tinkering Room. 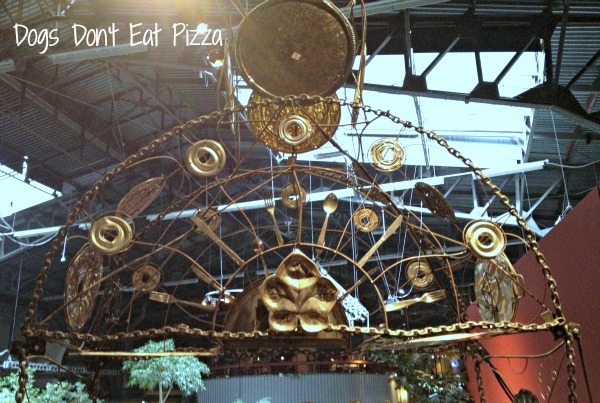 It is made from old silver platters, bowls, and silverware, all welded together. The picture (I only had my iPhone – forgive me!) doesn’t do it justice – the serving pieces and silverware design goes all the way to the floor. I want this in my garden. Or my dining room. Or anywhere near me, really. 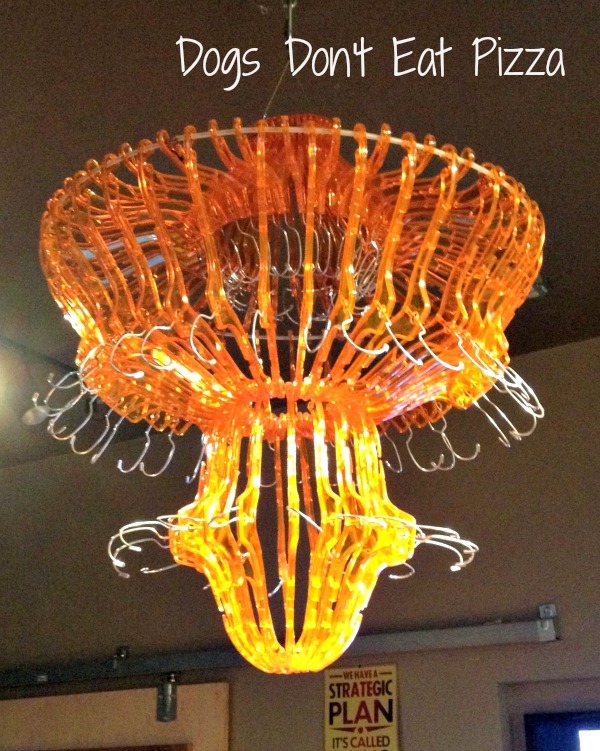 Then, as you continue in, you see this light fixture that, at first, looked to me like a jellyfish. Get closer…and you see that it’s made of plastic hangers! The whole thing is plastic hangers, which have been spray painted, connected together. I have no idea what to call it, other than the “what it is” wall. The exhibit is made up of blocks of wood, each with a crafty kind of word on it. Each word is made up of what it says. For example, the block that says “tack” has the word formed out of tacks. Same with “zip tie” (bottom row). “Knot” is made out of rope. I’m thinking I could recreate this on a much smaller scale. I just love it (me, lover of words and typography). My favorite is “bedazzle,” made from sequins and rhinestones. I stared at it for what seemed like hours. I just loved this area and how it showcased how you can make cool new things out of old things. If you like making new things out of old things, check out my repurposing and upcycling posts here. Just stopped by to say hello and thank you for linking up to the Curb Alert! Friday Block Party! That chandelier looks very interesting, I had no idea it was coathangers either until you pointed it out! Wishing you a Happy 2013!!! Thanks, Tami! Thanks for stopping by here! Happy New Year! That is so cool that there are coat hangers on the chandelier! I do like the color of it. Thanks for following me on FB. I’m now following you on FB, Twitter and Pinterest!